For more information, go to Low Point Lighthouse Society on Facebook. Low Point is an octagonal concrete tower, 72 feet (20.8m) high, painted white, with a red painted iron lantern. The lantern is from the original Chance Bros. Fresnel lens. The lens has been removed. The first lighthouse was an octagonal wood tower, 69 feet high, with red and white stripes, It had a round iron lantern and a 3rd order double bullseye lens manufactured in France by Barbier, Benard et Turenne. a red lantern. This lighthouse was replaced in 1936 by the current concrete tower, but the original lantern and lens were retained. Low Point boasts the only remaining circular lantern in Nova Scotia; built by Chance Brothers, England's famous builders of lenses and lanterns. It is also one of the few lightstations to retain its keeper's home. 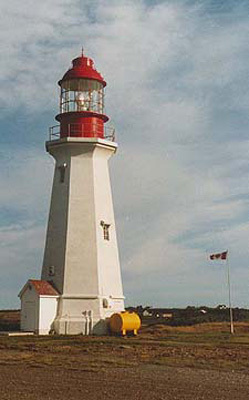 The lighthouse was automated and de-staffed in 1988. By 2002, the vacant keeper's house had been badly vandalized and the Canadian Coast Guard wanted to destroy it. Due to the efforts of a member of the Nova Scotia Lighthouse Preservation Society, the Sydney Harbour Fortification Society became interested in saving the keeper's house and opening it to the public. By December of that year an agreement had been made between the Atlantic Lighthouse Council (ALC),and the Canadian Coast Guard for the house to be leased by ALC and restored and administered by the Sydney Harbour Fortification Society. Repairs have been made, but the house is not open to the public. At the end of May,2003, vandals broke into the lighthouse. Seventeen panes of curved glass, mostly original, were broken in the lantern. In addition, the fog director was smashed, as well as several other window panes. A battery was dropped through the lens of a spare DCB-36 optic (airport beacon) stored on the site. A fire set in the keeper's house did not do much damage.The lantern was soon repaired using acrylic panels instead of glass, to prevent further breakage. Since de-staffing, there has been a history of vandalism at this site, but nothing comparable to this. It is heartbreaking for the group working to preserve this important site to have irresponsible people from the local community commit such thoughtless acts. Sadly, it is an example of what has happened to lighthouses across Nova Scotia since de-staffing. 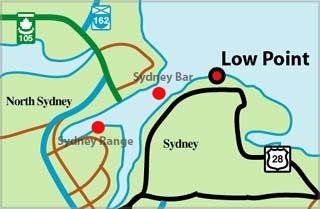 Located on a point at the entrance to Sydney Harbour, the ferries to Newfoundland pass this lighthouse every day. This photograph, taken in 1988, shows the second lighthouse, a concrete tower, built in 1938, crowned by the iron lantern which originally housed a dioptric lens. On the right is the keeper's house built in the 1950's. It has been restored and is in the care of a community non-profit group. Tower Height: 069ft feet high. Tower Height: 072ft feet high.